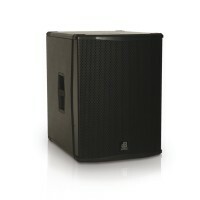 Amplifier Power800 Watts (RMS)ColorBlackCoverage (Nominal -6 dB)OmnidirectionalInput Connection.. Frequency Response [-10dB]35 - 150 HzMax SPL133 dBDirectivityomnidirectionalLF15"Voice Coil LF3"Ampl.. Frequency Response [-10dB]28 - 150 HzMax SPL134 dBDirectivityomnidirectionalLF18"Voice Coil LF4"Ampl..